If you think it’s silly to think that the same materials and energy-efficiency performance standards should be applied in different areas of the country, the government agrees with you. To create standards that properly reward and incentivize home systems that offer tangible energy-efficiency benefits, Energy Star has long studied and created maps that determine which set of standards should apply. For the most part, these maps follow other climate zone maps, though there are also considerations and state-level programs, including the one in Colorado, that may determine the exact requirements and standards that apply in your local. Here is our effort to collect and annotate various Energy Star Home and Climate Zone Maps. 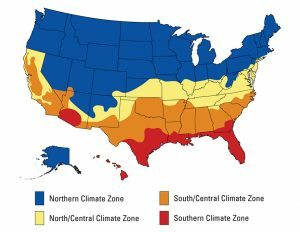 Though broad and generic, these four climate zone designations are commonly cited and applied to major home systems, namely windows, doors, skylights, and other insulating features. This map alone should answer some of the most common and basic questions about how your climate zone impacts the national-level Energy Star requirements that are in effect for your location. 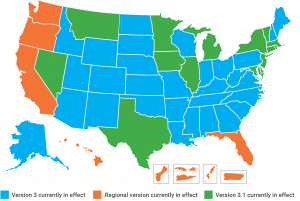 This map shows what version of the Energy Star Homes program and requirements are currently being used by each state. Some have developed their own state and region-specific plans in coordination with the federal agency. Some use Version 3 vs Version 3.1. Some of the differences in these rules aren’t the requirements and standards themselves but rather the effective date and grandfathered rules for appliances and systems that were considered energy-efficient in their time but have since become dated. Within Colorado, more specific Climate Zones may determine state regulations and available incentives available to homeowners and home builders. These follow the environmental and agricultural zoning climates and delineated on a county-by-county level. Note that the far southeastern quadrant of the state (Climate Zone 4) is in a different region (North/Central Climate Zone) than the rest of the state and its various micro-climate zones.